More often than not, taking vitamins regularly boosts your energy instead of making you tired, as fatigue is a common symptom of vitamin and mineral deficiencies. So if your vitamins are making you sleepy, it's time to evaluate why this is happening. It's quite possible you're taking too many vitamin supplements and exceeding recommended dosages. While iron is an essential mineral, getting too much of it can be toxic. The Arthritis Foundation says taking large doses of iron can lead to joint pain, depression, and fatigue. So while it's important to taking at least the recommended dietary allowance (RDA) for iron, which is 8 milligrams for men and women over age 50, 18 milligrams for women of childbearing age, and 27 milligrams for pregnant women, avoid taking more than 45 milligrams of iron from supplements daily unless recommended by your doctor, as this is the iron tolerable upper intake level for adults. Taking in too much vitamin D from supplements can cause calcium to build up in your blood, which can lead to feeling sick and tired. However, it can be difficult to consume the amount of vitamin D needed for toxicity unless you're taking very high doses. The Vitamin D Council says such high levels of vitamin D in your body can occur when taking more than 10,000 international units (IUs) a day for three months or more, or if you take more than 300,000 IUs of vitamin D within a 24-hour period. So if you're taking vitamin D supplements, stick with the RDA of 600 to 800 IUs for adults. High blood levels of calcium can cause fatigue, depression, and even confusion, says Mayo Clinic. For this reason, avoid ingesting more than 2,500 milligrams of calcium from supplements daily (unless your doctor suggests it). Instead, take a multivitamin supplement containing calcium (in doses less than or equal to the RDA of 1,000 to 1,200 milligrams) and consume calcium-rich foods like dairy foods or calcium-rich dairy substitutes (soy milk, almond milk, etc.). Fat soluble vitamin E (similar to vitamins A, D, and K) can build up in your body more easily than water soluble vitamins because these vitamins are stored within body fat. Getting too much vitamin E from supplements can cause fatigue, weakness, and feeling sick, says a 2016 issue of the Indian Dermatology Online Journal. So while it's important to take in at least 15 milligrams of vitamin E daily (the adult RDA), avoid exceeding the tolerable upper intake level of 1,000 milligrams per day. As with the other fat-soluble vitamins (E, D, and K), taking in too much vitamin A from supplements long term can lead to fatigue, joint and muscle pain, depression, and mental dullness. The National Institute of Diabetes and Digestive and Kidney Diseases says this can happen after three months of ingesting high doses of vitamin A (10 times the RDA). The tolerable upper intake level for vitamin A is 3,000 micrograms per day, so avoid taking in this much unless your doctor recommends it. The vitamin A RDA is 700 to 900 micrograms. Getting in plenty of vitamin B6 daily is crucial to help prevent B6 deficiency, which can lead to anemia (associated with feeling sleepy). However, MedlinePlus says that while B6 supplements are likely safe for most people when taken in recommended dosages, it can cause sleepiness (and a host of other side effects) when taken in amounts greater than the RDA. The vitamin B6 RDA is 1.3 to 1.7 milligrams per day for adults. It's important to steer clear of the B6 tolerable upper intake level (100 milligrams per day for adults) to help prevent tiredness. As with taking too much of the essential vitamins and minerals listed above, folate can also cause tiredness when taken in doses above what's recommended, says Mayo Clinic. For this reason, avoid taking more than 1,000 micrograms of folic acid from supplements, as this amount is the tolerable upper intake level for adults. The adult folate RDA is 400 micrograms (600 micrograms during pregnancy) per day. Consuming magnesium supplements can also cause tiredness (especially when taken in large doses). 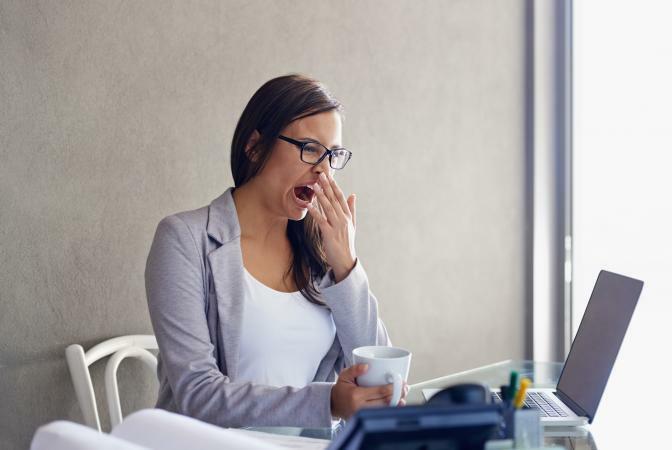 MedlinePlus suggests calling your doctor immediately if you experience unusual tiredness after taking magnesium oxide. To help prevent this from occurring, avoid taking more than 350 milligrams of magnesium from supplements daily, which is the tolerable upper intake level for adults. If you're experiencing tiredness and you think it might be from a vitamin or mineral supplement, stop taking the supplement immediately and call your doctor. A host of other factors (not vitamin related) can cause tiredness, but if fatigue occurs because of your vitamin supplement, chances are you're taking too much of it.